Heartwood Prayer Wheels is pleased to offer handmade prayer wheels built according to traditional Tibetan Buddhist specifications and made in accordance to the instructions of Venerable Kyabje Lama Zopa Rinpoche. 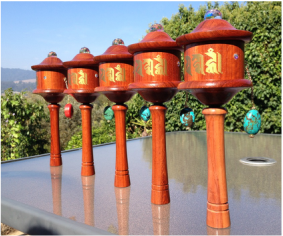 Each prayer wheel is handmade from beautiful Padauk hardwood and includes stainless steel lifetime bearings to ensure smooth turning. The top of each prayer wheel is adorned with a swarovski lead crystal. 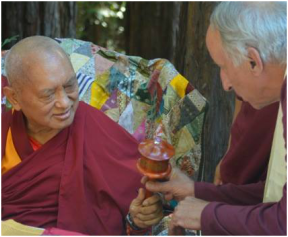 The life tree mantra and the earth and sky mandalas inside the prayer wheel were hand-drawn by Venerable Kyabje Lama Zopa Rinpoche. The Mani mantra was written by His Holiness the Dalai Lama before being reduced to fit on microfilm. Turning a prayer wheel creates extensive benefits for all beings because the mantras inside the prayer wheel are the manifestation of the Buddha’s holy speech. As a holy object, a prayer wheel has tremendous power to eliminate the self-cherishing mind that keeps us from realizing perfect compassion and thus reaching enlightenment. Please fill out our online inquiry form to learn how long it will take to build your custom prayer wheel and how much it will cost to ship it to you. Each prayer wheel is custom-made to meet your needs and specifications.